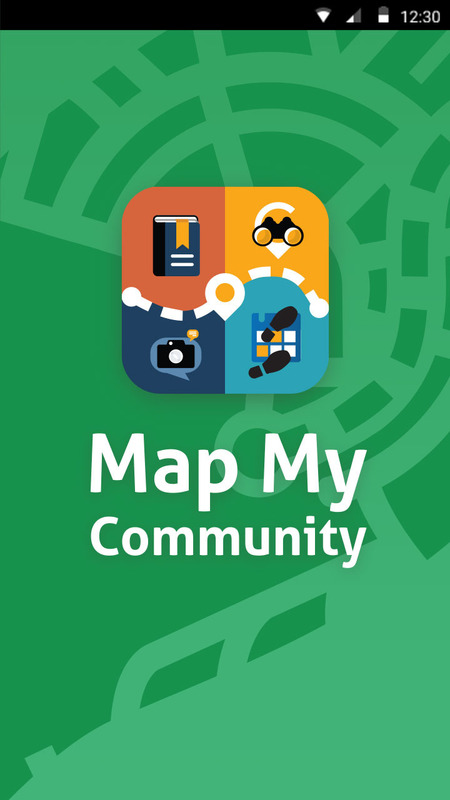 Map My Community is a research app enabling researchers to gather data on participants' use of the built environment, movement through and their feelings and experiences of it. Developed by researchers from the University of Birmingham, UK, the app has three features: Map my week, Capture that and Explore that space. It has been designed to be quick, easy and user friendly. Map my week: Gathers data on everyday life, mobility and use of community space. Outdoor movements will be tracked for a one week period and at regular intervals participants will be prompted to take part in short surveys to ask where they are, who they are with and how they got there. Explore that space: This feature enables the research team to pre-define specific areas of the urban environment to prompt information from users. The app will poll for a participant's position, decting whether they have entered a pre-defined area and then request the completion of a short survey. Capture that: This enables participants to share with researchers their emotional responses to specific features of the built environment. They are able to take photographs and comment on what they like or think needs improving. This mobile ‘app’ has been designed to explore mobility within your local area; exploring where you go, how you travel and your local experiences. There are three components to the mobile app; Map my week; Explore that space and Capture that. The app has been designed to be quick, easy and user friendly. The Map my week component will require you to use the app on a daily basis for seven consecutive days. The other features can be used as and when you want to. All activities in the project are optional – we hope that you would like to participate but understand if you don’t want to. The team will write articles and speak at conferences about what we have found; all the data will be anonymous, your name will not be made public. All data will solely be used for academic, dissemination purposes. Data will be stored on a secure, password protected server. Can I withdraw from the ‘Map my community’ activity? You can withdraw from the study at any time during the fieldwork (January 2015 – October 2015). You can withdraw your data from the study within two months of downloading the app. If you are living, working or visiting the case study area you can either contact one of the researchers or download the app from the Play Store. Please note that you must read and agree to the consent statements on the app before taking part. Map my Community has been designed as a research app for the study of new urban developments in India. The researchers are based in India from January - September 2015 and are encouraging people to take part in the app based research. If you do not live in a new urban development in India and you would still like to use and take part in the app research, you also need to agree to the research consent statements prior to participation. 6) Personal tracks will not be given to the UK Data Archive, this means that other researchers will not be able to use your tracks. Photographs and survey comments will be shared with other researchers, but your name will not be used. 7) If you are under the age of 18 you must ask your parent or guardian if you would like to take part in the project. 8) If researchers feel that you or others are at risk of harm then they have a responsibility to share information to protect individuals. In this instance they will attempt to contact you. In addition to these general consent statements, in each app activity, there are specific consent agreements to consider before participating. Map My Community was created as part of an ESRC funded project (ES/K00932X/2) based at the University of Birmingham. Uses crypto-js library for data encryption. (c) 2009-2013 by Jeff Mott. All rights reserved. Uses JSBN library for RSA encryption. (c) 2003-2005 by Tom Wu. All rights reserved.